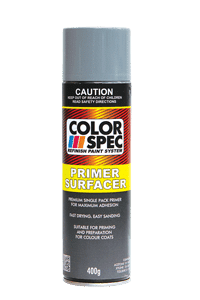 ColorSpec Primer Surfacer is a fast drying, easy sanding primer that bonds paint to steel and ferrous metals or repainted surfaces including fibreglass repairs. It is ideal for priming, and filling minor surface imperfections. Suitable for most automotive vehicles and parts, mechanical and household items. ColorSpec Primer Surfacer can be top coated with most conventional single pack colour coats, including acrylic and automotive topcoats.